Tunku Mahkota Johor’s wife Che’ Puan Khaleeda Bustamam heads the state’s honours list in conjunction with the Johor Ruler’s birthday celebrations. Khaleeda was awarded the Darjah Kerabat Pangkat Pertama (DK I) by Sultan Ibrahim Ibni Almarhum Sultan Iskandar. Five individuals were presented with The Most Exalted Order of The Sultan Ibrahim Johor Second Class Dato’ Mulia Sultan Ibrahim Johor (DMIJ), which carries the title Dato’. The recipients are Director of the Johor Islamic Religious Department Md Rofiki A. Shamsudin, Kumpulan Prasarana Rakyat Johor (KPRJ) Chief Executive Officer Mohd Noorazam Osman, Johor Islamic Religious Council Chief Executive Officer Mohd Noh Ibrahim, the ruler’s private secretary Jaba Mohd Noah and Deputy State Secretary (management) Dr Badrul Hisham Kassim. 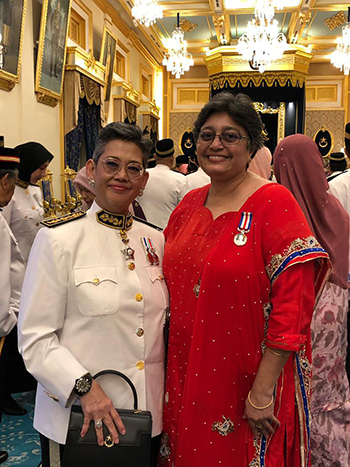 Iskandar Malaysia Social Hero Awards (IMSHA) winner, Lekha Nandey from Malaysia Red Crescent was awarded the Sultan Ibrahim Johor Medal Second Class (PSI II).